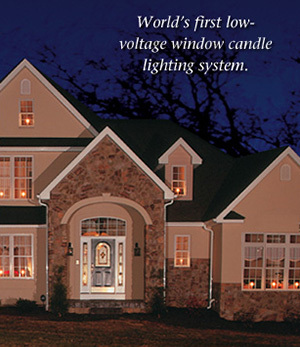 Window Candles are the world’s first and only built-in, low-voltage window candle decorating system. There is no other product that incorporates the same convenience, safety features, installation or design flexibility. Window Candles are wired into the window sills of your home. The installation process results in a securely mounted window candle with no exposed cords or wires. It is easy to install and remove the candle at each window. The candle simply slides in and out of a mounting clip permanently installed on the window sill. A small rubber cover can be installed over the mounting clip to protect it when not using the candle. Because they use low-voltage technology, the risk of shock is eliminated and the bulb is never hot to the touch, unlike high-voltage candles that can cause burns or fire. No exposed cords also eliminates the possibility of children and pets knocking the candles from window sills. Window Candles and the bulbs are available in many different colors, and the window candle bases are available in many different designs to match your window hardware.